Boil, peel and chop the potatoes. Make a liquid of water and all purpose flour in a bowl. Take two tablespoons of oil in a pan and heat it. Add onions and chopped green chilli to it. Add peas to it after frying for two minutes. Cook for 3-4 minutes and add ground ginger, salt, red chilli powder and chopped potatoes at last. Mix above ingredients well after turning off the heat. Mix up all purpose flour, salt, baking soda and butter and make strong dough. Make small balls of the dough and roll into thin circles of 5-6 inches. Cut into half with the help of knife. Smear liquid of all purpose flour and water on the sides and shape into cones. Fill the cooked potato mix in the cones and close the sides. 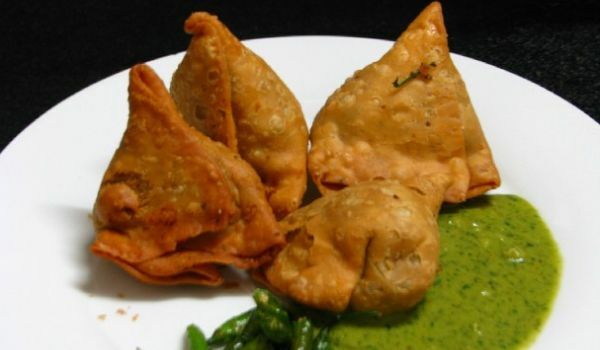 Now heat the oil in a frying pan and when it is hot enough, put the samosas in it. Fry them on medium heat till they turn golden brown.